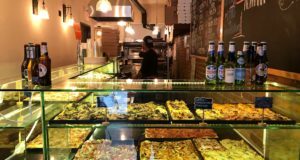 Yesterday, I wrote about my experience at Pizza Libretto in Toronto, ON [Toronto’s Pizza Libretto: Not Worth The Wait]. After a sub-par experience, my friend and I decided it wouldn’t be right to leave the city without at least trying one other place. Terroni, an Italian restaurant with three locations, came highly recommended. 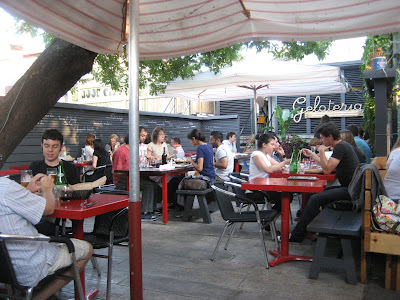 We’d passed by it on our way to Pizza Libretto and had noticed a line, but when we returned on Tuesday at 6:00PM, we were seated right away in their spacious (and adorable) backyard garden. The menu boasted so many intriguing items other than pizza, that we decided to split a pie and some other dishes. 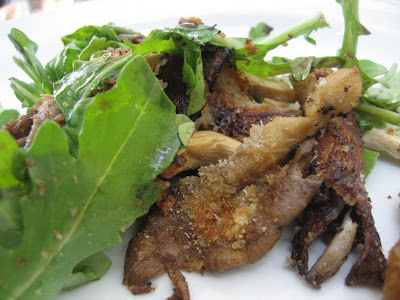 We started off with the Funghi Assoluti — oyster mushrooms tossed with garlic, breadcrumbs and balsamic then baked in the oven and served over baby arugula. Excellent! Usually at a pizza place I stuff myself with pizza, and only pizza, so it was nice to warm up my taste buds with a little appetizer. Next, we debated what pie to order — so many of them looked great — and decided to go for the DA DÓ A DÁ, with the help of a suggestion from our waitress. 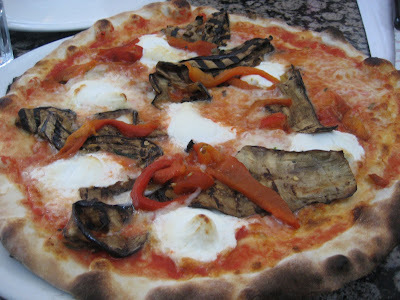 It was topped with tomato, mozzarella, goat cheese, eggplant, and roasted red peppers. The pie was excellent — the goat cheese may have been a tad strong, but that’s just a personal thing. It was cooked to perfection and each of the ingredients was fresh and tasty. 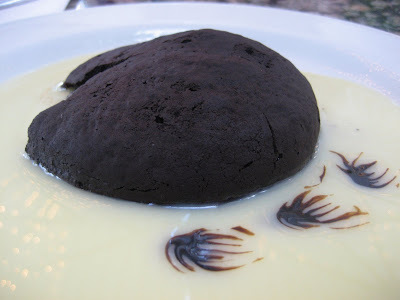 We topped the meal off with a Flourless Dark Chocolate Lava Cake – the restaurant’s signature dessert – which apparently takes 15 minutes to prepare. It was delicious, to say the least, and the great photo doesn’t even do it justice. This was my favorite overall meal in Toronto. 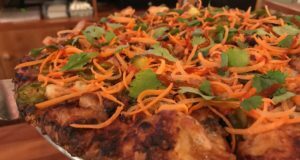 It was reasonably priced (about $40 total after tax and tip), the garden setting was picture perfect for a relaxing dinner in early September, the service was excellent, and most importantly… everything we ordered tasted great. You can tell they care about the food here. 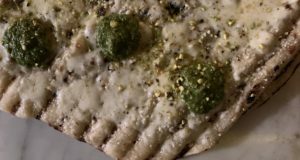 When we tried to order our pie without the peppers, our waitress told us that they cannot make any modifications whatsoever to any of the dishes. Although leaving off a few peppers didn’t seem like a huge favor to ask, such strict rules show that the restaurant and chef have confidence in the way their food comes out and any changes to that could result in a lesser product. I was surprised when our request was shot down, but delighted at how delicious everything was. Any trip to Toronto should include a visit to Terroni’s Queen West location.